In the case of “Earl” and “Dope” I think there is definitely a very wide generation gap. The last time I saw my teens was 60 years ago and though I enjoyed “The Fault Is In Our Stars” last year it was more of a drama than teenage angst. 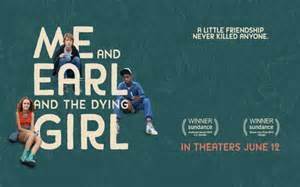 There is some humor in “Earl” regarding the movies that Earl (RJ Cyler) and Geg (the ‘Me’-- Thomas Mann) make redoing classics, especially the titles they give their films. Olivia Cooke is certainly endearing as ‘the dying girl, Rachel, while Greg grows up over the course of the film and Earl is a wise young man before his time. Molly Shannon as Rachel’s single mother and Connie Britton as Greg’s mother, both overbearing parents, along with Nick Offerman as his beatnik father---by the way Earl doesn’t have any parents and lives with his older brother who threatens Greg with telling him his dog will bite off his face--and Jon Bernthal as a teacher and, more or less, a guidance counselor to the boys, are sort of annoying adults you will find in most pictures about teenagers though the latter less than the others. “Earl” is being sold as a comedy, a sort of John Hughes movie with lessons to be learned. Greg is constantly reminding the audience--there is a lot of voice over-- that Rachel doesn’t die and there are screen titles telling the passing of time and where we are at in the story. As a social misfit Thomas Mann carries the film and RJ Cyer is his effective sidekick and shows his many sides. Olivia Cooke is endearing as the dying girl who has leukemia and is very instrumental is helping Greg grow up. The direction by Alfonso Gomez-Rejon is all over the place, somewhat like the movies the boys make, while the screenplay by Jesse Andrews, who wrote the best selling novel, is low key without trying to tell the audience how to feel. The director of photography shows off Pittsburgh, Pennsylvania, almost always in a glow of light, even in the night scenes. I laughed once and that was the boys film take-off of “Midnight Cowboy” with the “Everybody’s Talking” theme song and, for a comedy, laughing once is not a good endorsement. I left the theatre wondering whatever happened to the girl who got stood up on prom night--maybe that’s the sequel?